Very enjoyable read as usual David and best of luck with your book, I'm fascinated by the use of block armies so look forward to it. I'm going to try to see if I can get the French & British blocks back to the UK during January as my daughters will be visiting so I can split them between the suitcases to keep within the weight allowance. They are currently all organised in business card boxes so should be easy to pack. As my project progresses over the year you can have the Prussian, Austrian and Russian blocks too :) be great to see them put to use rather than just languishing in boxes as they have been for the past couple of years. An army level set of rules starting with the 1815 campaign is very much an itch that needs scratching for me and it has been a long time coming! At last - a fellow Waterloo enthusiast! 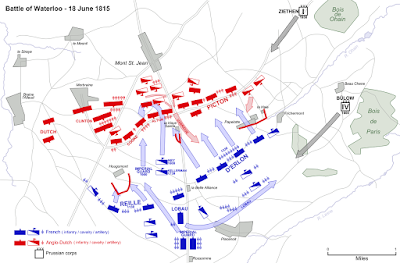 I have fought the battle on three occasions and so far have lost two (as the British)and won once as the French. I hope to be able to do something about this once the rules have been written! Happy New Year, David! I look forward to seeing how your rules and recreation of Waterloo develop. 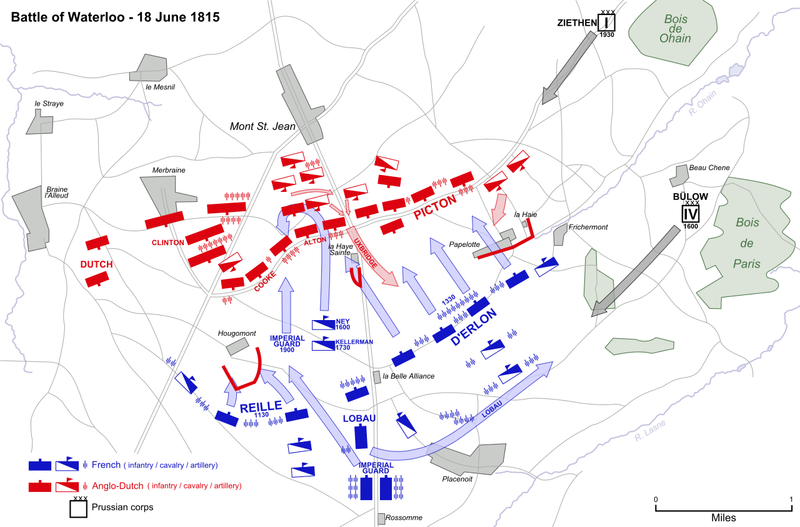 Having played several games - such as W1815 - that have been designed precisely to produce a game that bears a distinct resemblance to the original battle (and no other), rather than as a generic set of army level rules that could be used to fight Waterloo (amongst other battles of the period), I personally feel that combining the two aims in one set of rules is the most difficult option - so wish you good luck with that! Happy new year to you as well sir! The plan is to use Waterloo as a test bed for the rules rather than them behind designed specifically for one battle and yes you are quite right - combining the two aims in one set is going to be difficult but it is something I am going to try. Thank you for the good luck wishes - I believe I will probably need it! Lots of French cavalry running round Wellington's squares at the moment! It is not one I have read but the imagery is both inspiring and evocative.